From a TV background, Reed Morano (The Handmaid’s Tale) breaks into the film world with this gritty survival story after the apocalypse. Written by breakthrough writer Mike Makowsky (Take Me), who gives us a character driven story of a contented man, whose life is turned upside down. Del (Peter Dinklage, X-Men: Days of Future Past, Game of Thrones) by some freak chance has survived the apocalypse and has taken it upon himself to clean up the mess, caused by the unknown event where people just died wherever they were at some time in the past, judging by the crispiness of the corpses. He is methodical with his clearance, as he takes one house at a time and he systematically clears each house for any resources before setting about cleaning the ex-home. The rest of his time is spent sweeping the streets and burying the dead, all the while re-categorising all the books in his local library, as well as fishing for his supper. Del is happy in his solitary life and the self appointed tasks that fill his daily routine, until one night his pleasant slumber is rudely broken by the sounds of fireworks. As he stares in disbelief at the spectacular display, the realisation that he is no longer alone can be seen on his face. The next morning changes nothing (it wasn’t a dream) as the silence is broken by a car alarm, confirming his solitude is over. What he discovers a young woman in the driving seat unconscious, he patches her up and takes her to one of the empty houses. It turns out that she is Grace (Elle Fanning, The Curious Case of Benjamin Button, Maleficent) and she wants company, much to the annoyance of Del, who finds his routine ruined. See how they survive and as you can see by the credits that Charlotte Gainsbourg (Independence Day: Resurgence) and Paul Giamatti (San Andreas, Straight Outta Compton, John Dies at the End) make an appearance so watch out for the twist. I Think We’re Alone Now is a gripping watch from start to finish as Dinklage and Fanning spark off each other. 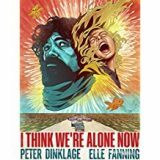 I Think We’re Alone Now is available on VOD.